Built with painstaking attention to each detail. Designed to indulge your every whim. The refined aesthetic of Yamaha's 232 Limited is capable of pleasing even the most discerning eye. Enveloping Twin High Output Yamaha Marine engines in a design of pure opulence, the 232 Limited provides unparalleled luxury in the form of supple seating, stainless steel accents and sun-soaked bliss. Captain's Chair and Upholstery: The plush, contoured design of the captain's chair gives an air of tailored elegance– enhanced only by the added height and support of a flip-up bolster seat. Stereo with MP3 Player Input: Equipped with a digital input for a personal MP3 player, the Sirius® Satellite-ready Sony® Stereo System further amplifies the boating experience. Enclosed Head Compartment: Adjoining the passenger-side convertible lounger, an upholstered head compartment provides privacy and additional storage space. Freshwater Shower: A refreshing extra, the freshwater shower conveniently tucks away on the swim platform, readily available for a quick post-swim rinse. Freshwater Shower: A freshwater shower built into the swim platform is an added luxury for rinsing off after a quick swim. Multiple Storage Compartments: Ten storage compartments include an enclosed head compartment (boat is not equipped with portable toilet), anchor storage compartment, storage under each seat and carpeted compartments under the starboard console. 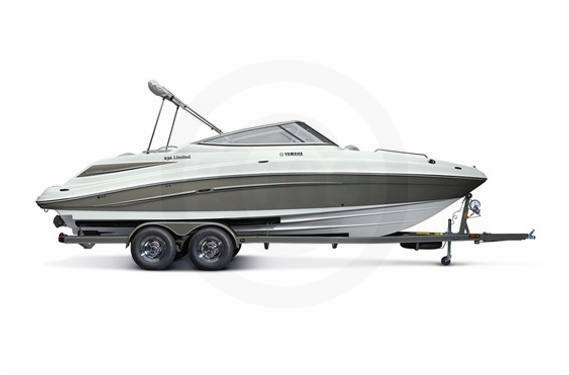 The 232 Limited is also equipped with a full-size ski locker that accommodates skis, kneeboards or wakeboards. Stern storage is perfect for wet items, like ropes and wetsuits. Stainless Steel Details including rubrails, cupholders, grab handles and pull-up cleats. 36-quart Built-In Ice Chest: Help keep beverages chilled and sandwiches fresh. Innovative Swim Platform: This award-winning stern with Hydro-Turf® mats and backrest cushions can be transformed into a private patio on the water. Included is a mount for the standard dinette table. Dinette Table with mounts at cockpit and stern. Center Walk-Thru Transom: Easy access to the stern patio area and swim platform from the cockpit. Telescoping Reboarding Ladder: For easy boarding while in the water. Sophisticated Dashboard Gauges and Helm: The 232 Limited features 4” dual tachometers, 2” fuel level gauge, low-fuel warning light, and depth finder. No Wake Mode™: Two buttons located at the helm easily engage this feature making idling through low speed zones easier. Custom Adjustable Tilt Steering Wheel: Allows the operator to adjust the angle of the steering wheel for added comfort. Independent, Dual Engine Controls: Adjusts each throttle position and control forward, neutral and reverse. Ample Seating for 10: J-shaped seating with a convertible lounger provides excellent comfort and versatility. Soft Marine Grade Upholstery with added bolstering for extra comfort. Marine Grade Berber Carpet Kit: High-grade, removable carpet throughout the cockpit adds to the 232 Limited 's comfort and luxurious looks. Flip-Up Captains Seats: The fully upholstered, flip-up captain seat provides an elevated view when flipped up. Stainless Steel Integrated Drink Holders: Located at all seat locations and above head compartment for easy access for everyone on board. Satellite equipped Sony® AM/FM/CD Stereo with Remote at Stern: Premium stereo and four Kicker® speakers guarantee you'll always have the right soundtrack on the water. High-quality Trailer: Every 232 Limited comes complete with a custom matching painted trailer with swing-away tongue for easy storage, spare tire and built-in retractable tie-down straps. 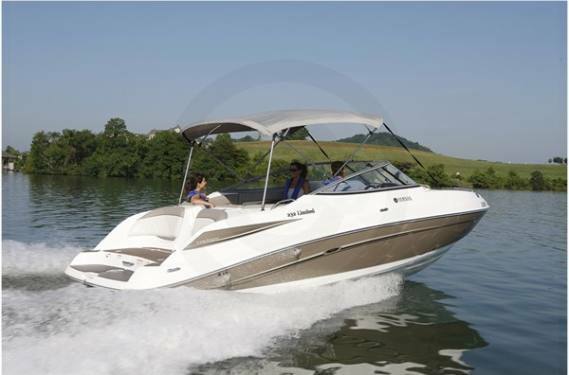 The 232 Limited is powered by two Yamaha High Output MR-1™ engines. These 1052cc four cylinder, four-stroke Yamaha marine engines deliver excellent power in a compact package. Dry Sump Lubrication: Uses two engine oil pumps to deliver and return lubricated oil to each moving part with water-jacketed sump and oil backflow protection. Yamaha Engine Management System (Y.E.M.S. ): An integrated, computerized management system that controls and adjusts such functions as ignition timing, fuel injection mapping and engine diagnostics. The 232 Limited twin 155mm hyper-flow high-pressure jet pump propulsion system with three-blade stainless steel impeller is designed to maximize water flow for high performance. The twin pump configuration provides excellent hook-up and smooth acceleration. High Flow Intake Duct and Grate: The dynamic shape of these items directs water flow into the pump for better thrust, performance and hook-up. Jet Pump Clean-out Plugs with Push Button Lock Mechanism: Allows for direct access to the inlet duct cavity to easily clear any debris from the pumps from inside the boat. The 232 Limited utilizes a deep-V, multi-chine hull with 20-degree dead rise. The hull and deck are constructed of multiple layers of fiberglass with sandwich core construction reinforcements. 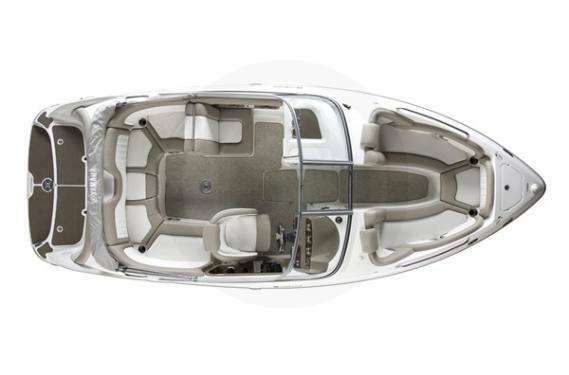 The fiberglass liner: Separately constructed, it represents a revolution in boat design, combining the floor, stringer, and engine mounting system. It is constructed from a custom blended polyester resin with engineered fiberglass laminates and 3/8" 6061-T6 aluminum plate for the engine mounts. The liner is bonded into the hull with polyurethane adhesive and then injected with foam to provide maximum floatation as well as longitudinal and lateral structural rigidity. The deck is then fastened to the hull with both mechanical fasteners and polyurethane adhesive giving this revolutionary semi-monocoque fiberglass structure unsurpassed strength and rigidity.